Each year the Friends of Sleepy Hollow Cemetery organize a breakfast featuring a guest speaker who lectures on the history of Concord and Sleepy Hollow Cemetery. These breakfasts have featured historians, authors, researchers, preservationalists, and distinguished residents. The Friends of Sleepy Hollow’s thirteenth Annual Breakfast Event was held on April 6, 2019. David Wood, the Curator of the Concord Museum, was the featured speaker. 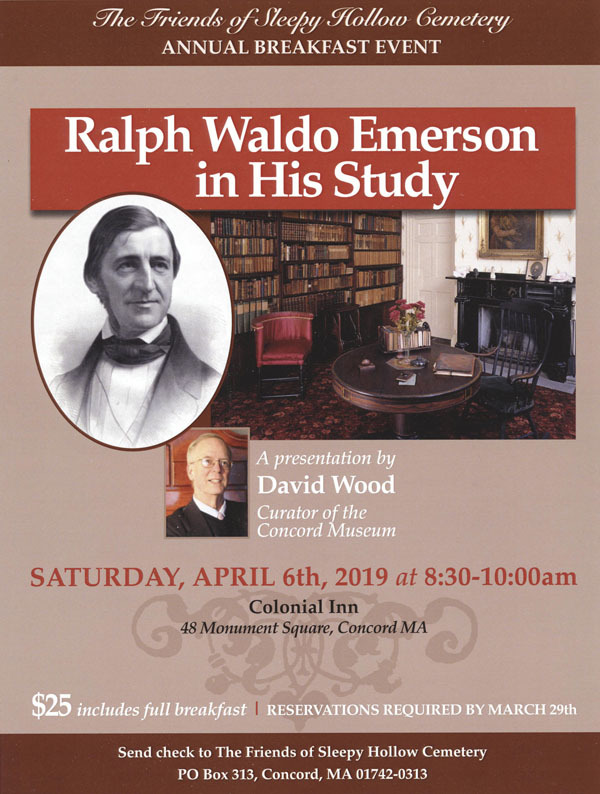 His topic, Emerson in His Study, brought us into the inner sanctum of this world-famous poet, essayist and speaker who lived in Concord and spent his writing, thinking and conversing hours in his beloved study. David described the cataloging of all the objects in Emerson’s study and shared the highlights of particular Emerson possessions, interwoven with the literary, philosophical, and courageous people who spent time with him in the study. Today Ralph Waldo Emerson’s work remains timely and instructive. He challenges us to be true to ourselves; to heed our highest instincts; to act rightly; to strive for broad understanding through study, observation, action and reflection; to persist through adversity; to face the world with courage, civility, humor and humility; to learn from the natural world; to seek to be one with the universe. 2018 - Pulitzer Prize-winning author John Matteson returned to describe the research for his upcoming book, tentatively titled Five at Fredericksburg. 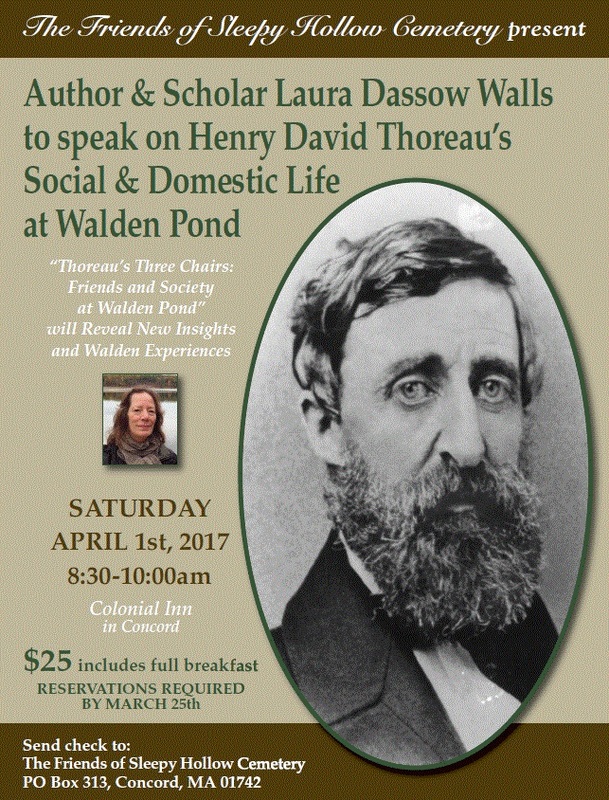 2017 - Professor Laura Dassow Walls, a Thoreau scholar and author of Henry David Thoreau: A Life, spoke in honor of the bicentennial of Thoreau’s birth. 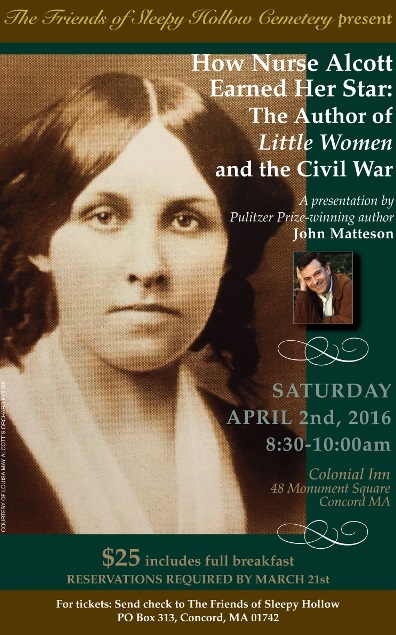 2016 - Pulitzer Prize-winning author John Matteson spoke about Louisa May Alcott’s life-changing experience as a nurse during the Civil War. He described how Alcott found her literary voice through this experience. 2015 - Concord Museum Curator David Wood spoke on cabinetmaker William Munroe and described a time in history in which Concord was the second largest manufacturer of clocks in New England. 2014 - Jayne Gordon, Director of Education and Public Programs at the Massachusetts Historical Society, presented Mourning Hawthorne: The Gathering at the Grave. 2013 - Architectural historian Anne Forbes described the important local characters who shaped the town of Concord by building, developing and designing the streetscapes and neighborhoods of their native town. 2012 - Megan Marshall, described her experiences researching and writing her book The Peabody Sisters, Three Women Who Ignited American Romanticism. 2011 - Polly Atwood, the history of Africans and abolitionists in Concord prior to and during the Civil War era, and the Drinking Gourd Project that was formed to raise awareness of these issues. 2010 - Leslie Perrin Wilson, an exploration of the accomplished people who lived in Concord during the 1800's. 2009 - Donna Hassler, discussion of the career of Daniel Chester French and his studio Chesterwood. 2008 - Jim and Minxi Fannin, The Architecture and Symbolism of Early Cemetery Stones. 2008 - Retailing in Concord - Stores Over the Generations. Karen Anderson (Main Street Market and Cafe), Fritz Kussin, Louisa Alcott Yamartino (Fritz and Gigi's - The Children's Shop) and David Hesel (The Toy Shop). 2007 - Jayne Gordon, addressed the many luminary figures in American literature, the arts and education that lived and supported each other in Concord including the Alcotts, Emersons, Thoreaus and Hawthornes, all of whom are buried in Sleepy Hollow. 2007 - Charles Dee Jr., presented the fascinating movies his great grandfather Joseph Dee took of Concord during the 1930's, including the 1938 hurricane. 2007 - Richard Wheeler, 11th generation Concord resident - the Wheelers arrived in Concord in the mid 1630's. Rick shared some of the family lore from the 17th century through the 1850's.